You see, I signed up for the A-to-Z Challenge. What is the A-to-Z Challenge? 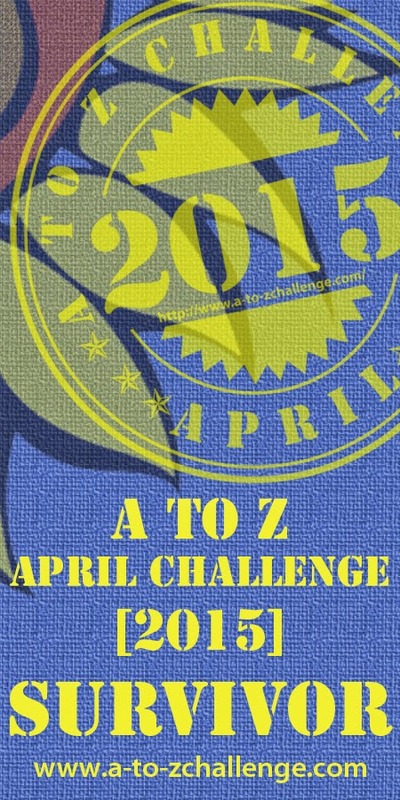 The A-to-Z Challenge is a blogging event wherein writers will submit a post each day (excluding Sundays) throughout the month of April with each post relating to a topic that begins with each subsequent letter of the alphabet. April 1st will be about something starting with A, April 2nd is B, and so on… Sounds neat! It really does! And many people choose to write about a certain theme each year. Many of which have been revealed today! What’s your theme, Wise the Simple? Well… I actually don’t have one. This is my first year trying the challenge (and my first year blogging), so I figured I’d just write about whatever strikes my fancy. Expect a lot of the usual stuff you’d normally see on wisethesimple — board games, books, tv shows, and random thoughts about life. Cool beans. Looking forward to it! Well, don’t get your hopes up too high. This may be a total disaster. If you haven’t noticed, I’ve been pretty bad about blogging regularly. So this experiment may crash and burn. D’aww, don’t say that. I believe in you!! I’m super excited for the A-to-Z Challenge. It will be a fun experience, as well as a great way to discover some new blogs to read! Last time I checked there were 1170 blogs signed up to participate this year. Interested in being number 1171? Sign up for the Challenge here! Happy spring tidings to you all! Good luck, I feel the same with mine! I’ve been awful at blogging regularly and it’s coming up to my exams yet I couldn’t resist attempting the challenge.. Have fun and hopefully I’ll see you on the other side!